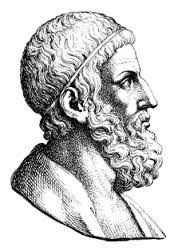 Archimedes was an ancient Greek mathematician, physicist, engineer, inventor and astronomer. He proved many theorems in geometry, such as the area of a circle, the surface area and volume of a sphere. He was one of the first to apply mathematics to physics, explaining the principle of a lever. He designed several machines, such as a screw pump, compound pulleys and even a heat ray to use as a weapon! Archimedes lived in Syracuse in Sicily, from c.287-212 BC. The city was a self-governing Greek colony which the Romans continually tried to capture. 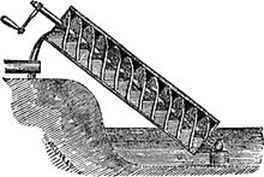 Archimedes designed machines to help defend the city from siege. Archimedes was killed by a Roman soldier after they took the city after a two-year siege - despite the General's orders to keep him alive. 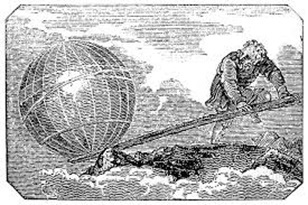 Archimedes proved a lot of the geometry relating to circles, spheres and cylinders. His favorite proof related to a sphere fitted inside a cylinder. He showed that the volumes and surface areas of the two shapes are related. He liked the proof so much that he had a sculpted sphere and cylinder placed upon his tomb on his request. The slider below discusses the sphere inside a cylinder. The term "a Eureka moment" (when you suddenly understand something that has been incomprehensible to you) is well known in popular culture. But what does 'Eureka' mean, and where does it come from? Archimedes had been asked by the King to check whether his crown was made from pure gold. The mass of the crown could easily be found, using scales. The density of gold was also known. By dividing the mass of the crown by its volume, the density of the crown could be found. If it was the same density as gold, the crown was pure gold. All Archimedes had to do, therefore, was find the volume of the crown. But how? 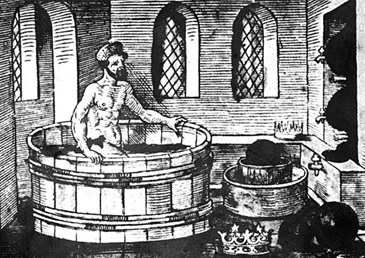 The idea came to Archimedes while he was bathing in the public baths. He realised that as he got in the bath, water would spill out of the edge. In fact, the volume of water displaced by him would equal the volume he took up in the bath. To find the volume of the crown, he just had to immerse it in water and see what volume of water it displaced. The solution to the problem so impressed Archimedes that he got out of the baths and ran down the streets naked, yelling 'Eureka' - "I have found it!" Archimedes was a great inventor. By turning the screw, objects could be taken from the bottom of the screw to the top. It was used to remove bilge water from ships. He is also said to have invented a hear ray - using mirrors to focus the Sun's rays on enemy ships! While Archimedes did not invent the lever, he was the first to explain the theory of how it worked. So, the force is 20N. 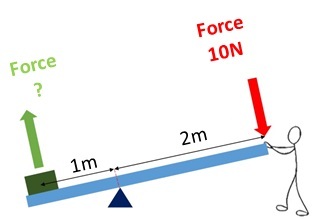 The man has applied 10N of force to the lever to get 20N out the other side. This is the usefulness of levers: by applying a force twice as far from the pivot as the load, you double the force applied to the load. By standing three times as far, he would triple the force he applied. "Give me but a firm spot on which to stand, and I shall move the earth."